huck and i met a friend for some tortas at brandon's and my new favorite taco shop this afternoon, and then when it started to rain we caught a cab home. as the rain tapped on the roof of our cab i thought about how a good rain can be a fresh start. huck quickly fell asleep on my lap, those sweet chubby cheeks bobbing and bouncing against my arm as the rain fell steadily out the taxi window. the wipers wiped methodically across the windshield, and i was excited to get home and cozy in. 06. i could never justify buying these, but aren't they pretty? 07. is the quality any good? does it matter? it's cute. I love this post. A good rain can wash it all clean. It's like fresh starts. Natalie, I think it's really dishonest when you don't disclose affiliate links in your posts. I have the disclaimer on my about page (or maybe it's the where did you get that page, it's been a while since I've been in there!) and it's certainly not my intent to be dishonest! thanks for the feedback, I'll start to include disclaimers in the posts themselves. it's such second nature to me now that I hardly think of it anymore. sorry to disappoint you! I love this. So perfectly captures the melancholy characteristics of a rainy day during a tough week. You've got this Nat. You've got gumption, you've got strength, you've got wit, you've got a sweet little boy who believes you hung the moon and the stars. You got this...and we're rooting for you! i've heard mixed reviews about the crosley...i borrowed one from a friend for a few weeks and thought it worked fine! buuut apparently i'm not quite the pro at determining what is or is not good sound quality (i thought it sounded fine, a musician friend did not). it's definitely cute though! You are so funny and awesome Natalie. amazing post. i love your attitude, and your writing, and your good taste. you got this. Did you know Costco food courts are switching to Pepsi nationwide! I almost died today when we went for hotdogs and they handed me Pepsi cups! World shattering. I had a crummy week, too. Rainy days are so soothing on weeks like this. And your rainy day list is similar to mine. Love the Senegalese woven baskets. So need some of these at home!!! Question: I love the look of Hunter rain boots, but apparently a decade of ballet means I have monstrously large calves that don't fit in the boots! Any suggestions for another pair of adorable rain boots for the girls with large calves? Hunter actually makes a style called The Huntress. They're shorter, with a wider calf. Still very cute. 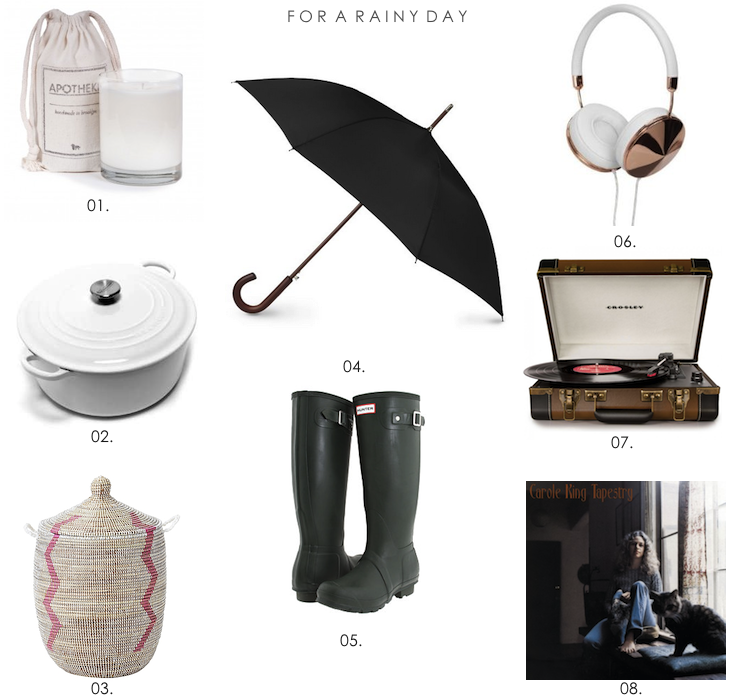 Your collection makes the thought of a rainy day feel so much cozier! Natalie, this: "this isn't the third grade anymore and there is more to me than what i let on to myself. i know that i can do this. i've done so much more and you ain't seen nothing yet." Trader Joe's has dried mangos. So that's what you do 'bout that, sista. Living in a small Florida town I never thought about Cab rides with toddlers. Do you not have to have them in a toddler seat? Is that ok? We are going on vacation this summer and I just realized the traveling from hotel to sites with my 3 year old didn't occur to me. Thank you for putting Apotheke on your list! (It's my sweet friend's line.) rio and i would like to send you one, where should we ship it. send me your info at info@strollernaps.com…. Did you know...Carole King is premiering a Broadway musical based on her early music? It's in casting and I believe will be up late 13/early 14. Now THAT is something to truly smile about :) Crossing every finger and toe to make it happen. Keep cleansing, keep believing, you're a rock star. Sorry you had a bad week. Hope this next one looks a little brighter. p.s. I laughed so hard at "mother effin mangos." Isn't it the worst when you make the long trek to the store for something super specific and they don't freaking have it?? carole is the best. she's a cure-all or a celebration enhancer. a jill-of-all-trades, that one! Carole King is one of my absolute favorites, you can't be sad listening to her! I am seriously in love with your blog, it's so fun - funny - witty - amazing - !! , and your pictures/words/adventures/etc. are so stinkin' good. Awesome. Comments are moderated because mama ain't no fool. this blog is a love letter. i watch a lot of meg ryan movies. A QUICK TRIP TO DC!